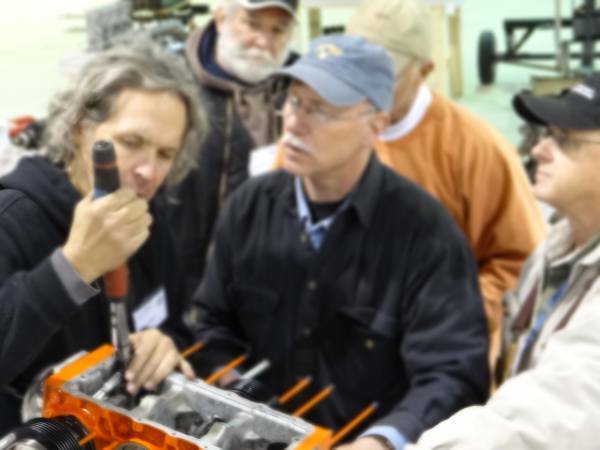 Above at left with me is Blaine Schwartz of Texas, a Zenith 750 builder who assembled his 2850 cc, Roy bearing equipped engine with Falcon heads at Corvair College #22. 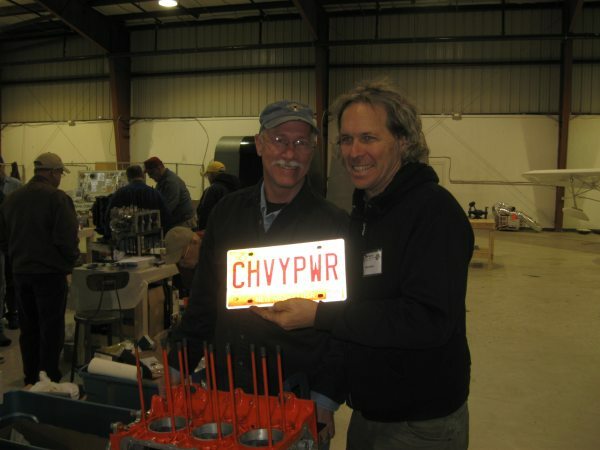 In this photo, we hold Blaine’s license plate displaying that he is a devout Chevrolet fan. 10 years ago, General Motors put up billboard advertisements with pictures of red Chevrolet Corvettes. The only caption they put on the bottom of the sign was big print that said “They don’t write songs about Volvos.” Building Corvairs is part of my lifelong admiration and passion for Detroit engines. The above photo shows where Blaine started midmorning on Saturday. Roy shipped the case already assembled with his bearing on it with the crank and cam in it. This is how he delivers his product to builders. This is why at first glance it appears to be substantially more expensive than the parts to build a Weseman bearing engine. Blaine found it a good value and worth the wait to get a running start at his engine. This assembly from Roy is completely compatible with all of the products that we sell and directly works with Falcon heads. 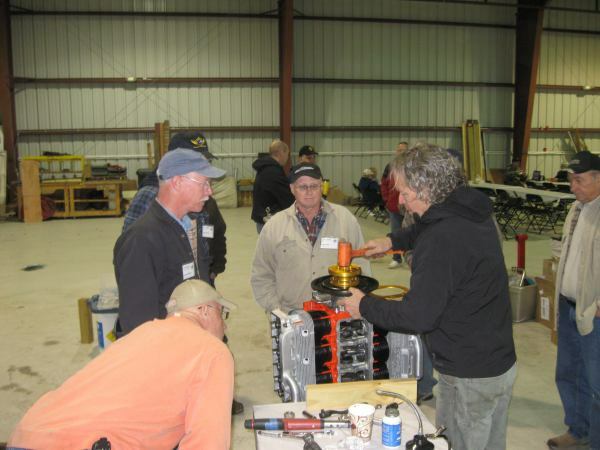 In the above photo I am demonstrating to Blaine the use of my Snap-On electronic torque wrench on the rod bolts. 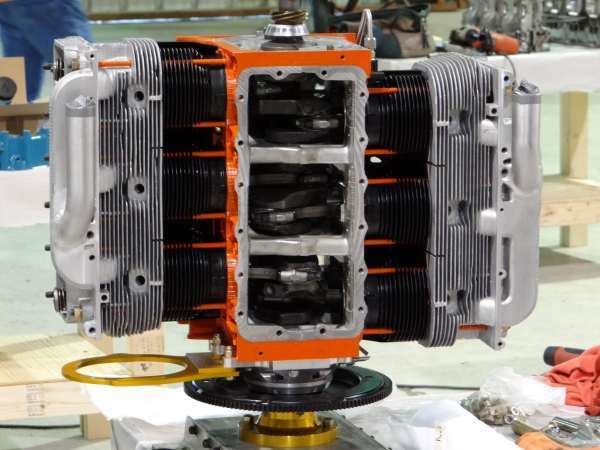 An overhead view showing the Pistons and Cylinders installed. 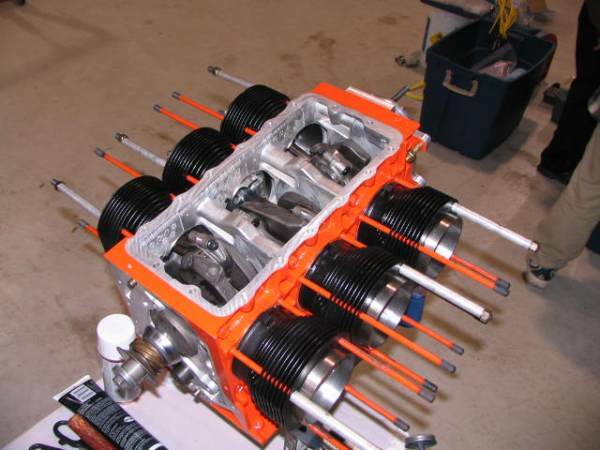 Blaine’s engine is a 2850 cc powerplant, utilizing a Piston and Cylinder Set from us. The cylinders used in the Kit are Clark’s full fin heavy duty cylinders, bored .105” oversize.Clark’s does this boring for us on their very accurate machinery. In the above photo, I use a soft rubber mallet to tap on Blaine’s Gold Prop Hub. 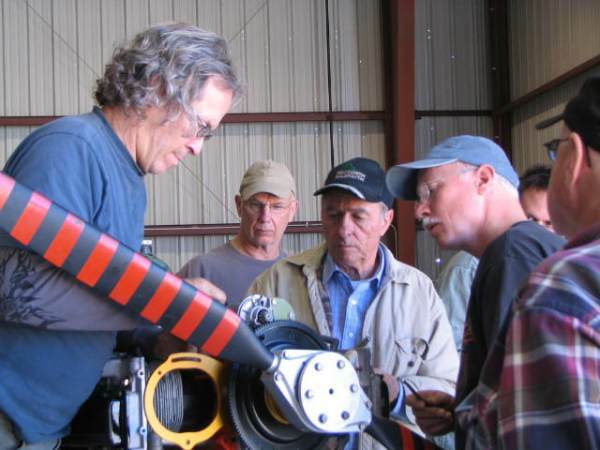 Engines equipped with Roy’s fifth bearing use a Short Gold Prop Hub. The above position, with the engine standing on its nose, is my preferred position in which to set the valves. This photo also gives a good view of the full fin heavy duty cylinders from Clark’s that are part of our 2850 cc Piston Kit. 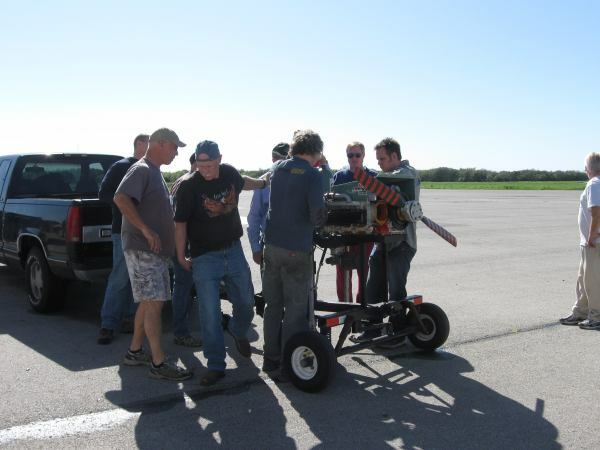 Above we are bolting on the Front Starter and giving it a good look before taking the engine outside to fire it up on the ramp. 30 hours later the engine is on the test stand ready for its run on Sunday afternoon. 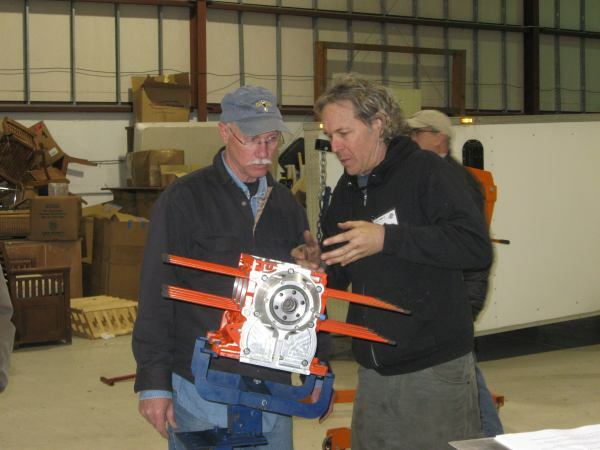 We utilized the engine to teach many people the assembly and priming sequence and how to install a Distributor. Above, Blaine’s engine a few minutes into its test run. We did a full 30 minute break in on the engine with the RPM between 1800 and 2200. The engine ran flawlessly. 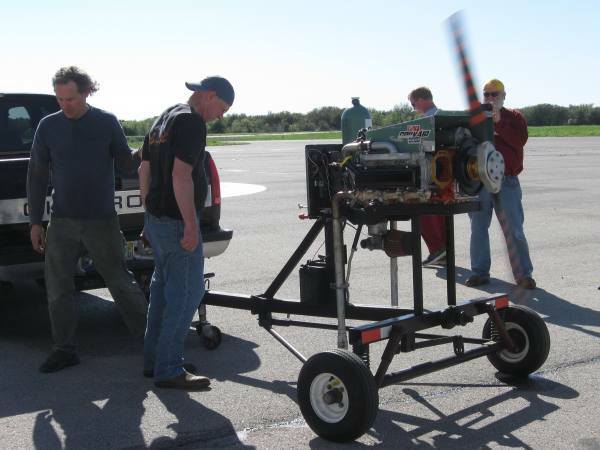 Hats off to Blaine, John and Becky for running their engines at Corvair College #22.